There are a few places outside the Orange Curtain that this food lover will brave freeway gridlock for. Actually, there are more than a few. Portos, Din Tai Fung, and Philippe French Dip come to mind. 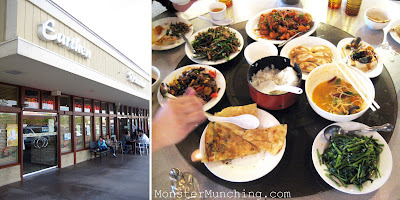 But closest of all, just over the hill beyond North Orange County, is Earthen -- a Chinese restaurant so insanely popular and so insanely good, it must be the envy of all its competitors. Even in this recession, you will always, always, find yourself on a waiting list*. The reason isn't surprising: The green onion pancakes ($3.25) and the pork pot stickers (10 for $6.50) are, for lack of a better term, the best. And that's just two specialties from a menu that honors the cuisine of Shandong province -- a Chinese cooking style that sees a lot of noodles, pancakes, dumplings, and other things wonderfully derived from wheat flour. And if you've never been a dumpling devotee, you will become one when you taste it here. With Earthen's perfect parcels of pork, you won't find any hidden air pockets -- it's filled end-to-end with meat. Every bite yields hog heaven. The only difference between the pot stickers and their steamed cousins, the dumpling, is that they are crisped up on one side and presented with their browned bottoms facing up. Their doughy skins are thick enough to carry the cargo, yet thin enough that it disintegrates once your start chewing. Also not to be missed is Appetizer #8 (no English translation, sorry) -- a block of chilled, silken tofu topped with quarter slices of thousand-year-old-egg, slathered with a salty sauce and garnished with scallions ($2.95). Since there's no congee for them to hide behind, this is the closest and most personal encounter you'll ever have with the thousand-year-old-egg. Those fearful of its dark, alien appearance, shouldn't be. Apart from the slippery gelatin chew, its flavor is even milder than regular hard-boiled. The combo of it with tofu is indescribable and thrilling -- deliciously unlike anything you've ever put in your mouth (unless you've had it before). The noodles at Earthen are almost as thick as udon, but not as chewy. And though the broth in the "Sea Food Noodle Hot Soup" ($6.50) needed a touch more salt, it is still the ultimate antidote for our recent cold snap. The orange-hued liquid scorched like it was mixed with kimchi juice. Just make sure you dab all the sweat off your brow before you step outside into the freezing breeze. 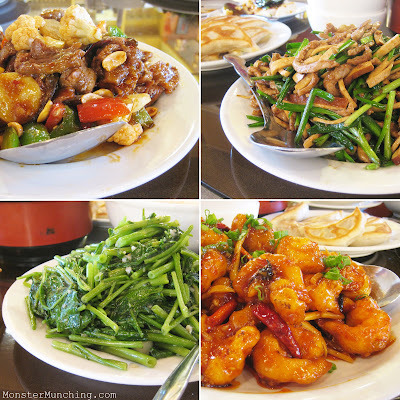 Other dishes, like the kung pao beef ($6.25), bean curd with pork ($6.25), sauteed ong-choy ($6.25) and fried shrimp with hot garlic sauce ($15.95) were pitch-perfect recitals. The ong-choy crunched with a snap and came studded with green onions; the batter-encased shrimp had a heat that snuck in with the sweet and vinegary punch of the soaked-in glaze. All are to be heaped over a bowl of rice, shoved by chopsticks directly into the gullet, chased by plenty of hot tea, and paid for by cash. *Above picture was taken close to 3 P.M., after the lunch rush. **Special Thanks to Monster Munching location scout Cecile for the tip on Ellen's Pinoy Grille. elmo, long time reader and appreciator of the various OC/Irvine restaurants since we seem to live pretty close to each other but how could you go to earthen and not get the 山東燒雞 (shandong chicken), it is, along with the green onion cake, the two must have items at earthen! Keep up the great work. I know, I know. I'm ashamed. I knew about the Shandong Chicken, but it completely slipped my mind! Next trip fo' sho! ok, it is only 7:55 AM, so why am I suddenly starving? Man that food sounds dee-lish! I will have to figure out a way to venture forth someday soon. yea i've been meaning to check this place out...i think they're closed on mon/tues too. After reading your post, I think perhaps Earthen warrants a roadtrip on my end, as well. Earthen doesn't seem to be too far of a drive for me. Maybe I should brave gridlock for it too. And wonderful review on Ellen's in the Register as well. Sisig is where it's at! I was just there today. I guess great minds do think alike. My ethnicity is actually from 山東. They didn't put the dried anchovies on their duck egg/cold tofu platter. Next time I'm going to bring my own.Give their steamed dumplings a try whenever you get the chance. I do have to say their cooked dishes are a bit on the expensive side. They do serve you a big amount nevertheless. Eventhough I ate this meal recently, I, too, started salivating when I re-read this post today. I had to make do with Chinese take-out, since I was back in O.C. It's still more bearable than what used to be Din Tai Fung's line. The wait at Din Tai Fung, by the way, isn't as long as it used to be, now that they've opened that second store next door. Thanks for the compliment! I got lucky with the shots this time. And actually, I think Earthen is so popular now that they only close on Tuesday! Nah, you're in SF now! I bet there are plenty of places up there that beats this one with its little pinkie. But I have to admit, that onion pancake is really hard to top. I think you'll like this one! And yes, you're closer to it than I am! And thanks for the sisig shout out. And I mean what I said: I LOVE FILIPINO FOOD, but especially SISIG! Dried anchovies! MMM...that would put the dish into orbit for me. I can see (rather, I can taste) how that fishy flavor and texture would work really well with it. Dave's mom's family is originally from Shangdong, and Dave is always excited to find places that make Shangdong style cuisine. I'm a big fan of the thousand year old egg and tofu dish, and even make it at home. And we all love scallion pancakes and dumplings as well. Especially Xander. I'm hungry now! wow! those looks really good, even from here.. but what a funky name for a chinese restaurant.. is it more modern? Wow, this place sounds awesome. It is not too far from my neighborhood. What other noodle dishes would you recommend? I can see how the food of Shandong would be classic comfort cuisine. I'm not from there and I'm comforted by it's deliciousness and simplicity. I can't figure out the name either. It's certainly a nice restaurant, with modern design elements inside, but that name...beats me! 1) Take a lot of pictures. Chances are if you take 10, 1 will be in focus and good. 2) If the lighting isn't quite up to par, enhance with the Curves function in Photoshop! I haven't tried it, but a lot of people seem to order the Beef Noodles Soup. Also, that Shandong Chicken. FYI: If you want to peruse the menu, I scanned it and included the link in the review. Look for the highlighted words "a menu". I hope you enjoy! Elmo, I just discovered Earthen recently and loved the food too, but your post is so much more eloquent than mine. Happy Holidays to you! Onion pancakes shouldn't be this addictive! Now I really have to make sure I try that Shandong chicken. Just so I have something to dip the pancakes in. Ah! I completely missed your post! I need to read it now. Happy New Year to you and yours! Hello! I got to your site via Burnt Lumpia. Of all the food photos you showed on the Hacienda Heights post, I zeroed in on the century eggs dish. It's been ages since I had them. Guess at this point, looking at photos are good enough (temporarily). No Chinese/Asian restaurant I know would serve them, at least here in laidback town called Eugene, Oregon. Then the ong-choy dish came in next. I just love the crunch of the vegetables. This dish is more common. Happy New Year Yarn Hungry Hog! I can't think of any other restaurants around here that serves that egg and tofu dish also. It's a shame. It should be more popular than peanut butter and jelly. This is the kind of post I love to see. Haven't read your blog in a while and it's looking better than ever, now that I'm combing through it again. I take back what I said about not agreeing with half your posts. That was then this is now. Hah! Well, since half of what I eat is meat, I figured that you were just agreeing with the half where I ate veg! The beef noodle looked great on paper (and in pictures) but didn't quite live up to expectations. Maybe they were have an off day. The beef was tasteless and overcooked and the soup base was really diluted. Overall considering the awful wait time, I can't give the place more than a C+.